« 1936 Junior Leader’s Training Course…Consider Yourself Americanized! 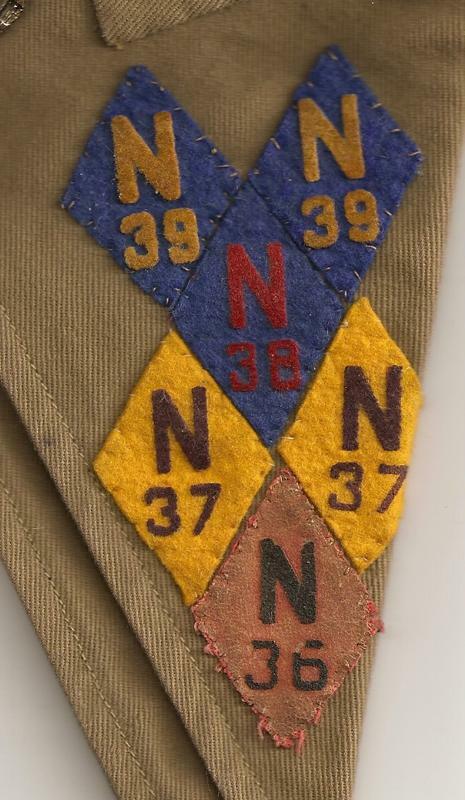 An area collector recently found an amazing sash with a connection to Camp Naish on an a popular online auction service. Shown below, is the sash with six Camp Naish felt diamonds (one from 1936, two from 1937, one from 1938 and two from 1939). Based on my knowledge, there were between 8 and 12 total diamonds in local collections prior to this find…the fact that this sash has six is truly astonishing. I saw the sash first hand at Tamegonit Lodge’s Vigil Banquet this year and it is in great condition. As I previously posted here, there was a gap at year 1938…until now. As shown in the picture below, the 1938 diamond is shown with blue felt and red text. Additionally, it is interesting to note that the Scout apparently attended for two sessions in 1937 and 1939. So the next questions to answer are: are there more sashes like this out there? Is there a diamond for 1935? 1941?